Pachyphragma plants and species includingPachyphragma macrophylla and Pachyphragma procumbens are a clump forming spring flowering perennial underused in Australian gardens. These are excellent ground cover plants for shaded positions. P. macrophylla with its pretty white flowers makes a good ground cover plants in a woodland situation. 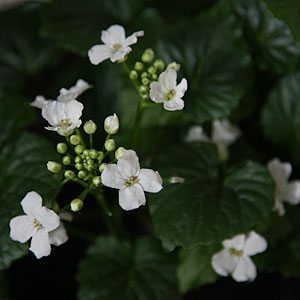 It will form a dense cover of green foliage, large green scalloped foliages and masses of white flowers held well above the foliage in spring to summer. P. procumbens with its pink flowers a little like spikes of bottlebrush and mottled foliage is also excellent. These are an excellent plant for underplanting trees and shrubs where a ground cover is required. They will form a dense matt and crowd out weeds. They grow well in soils that are on the dry side, an advantage in many gardens. A humus rich moist soil in dappled shade is best, try digging in some coir peat and well rotted compost to make this an easy care plant. Propagation is by division in late spring.